I’m 34 years old right now, and I lead our business development efforts for Nuance Financial – I’m the “sales” guy. Over the last 13 years or so, I’ve had an opportunity to interact with tens of thousands of people working in retail, serving food in a restaurant, being a financial advisor, and serving as a Pastor. While these tens of thousands of personal interaction have served as a “doctorate program” for sales and interaction – the coaching and modeling I’ve had the pleasure to receive from my Dad has been absolutely priceless. I’ve read through this book’s first edition a couple of times and love the guidance it provides. If you’re in a sales profession, I’d highly recommend picking it up and using it as a reference to help yourself out. If you are an entrepreneur, I absolutely insist on buying this book and internalizing as much of it as possible. You won’t get more than 5 pages into it before you’re given some concepts that will help you improve in your development efforts. While you’re working on your elevator speech, and honing your core focus, this book will provide you with invaluable sales principles and behaviors. 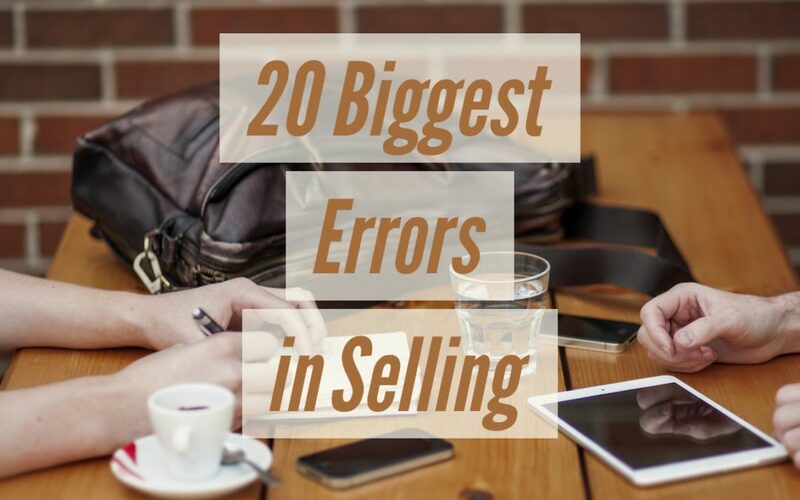 On it’s second page, Bill Brooks gives a tremendous list of errors made when selling but notes that there are two main mistakes we make as sales people. They don’t ask enough of the right kinds of questions when they do get in front of qualified prospects. Those are the two greatest mistakes that sales people make, but it can be even worse for Entrepreneurs because they wear so many hats. If you own a company and have hired a couple of sales professionals to help you, this list can help you build some questions for performance coaching.